Rogue Trooper Redux review: "A shooter that somehow manages to feel both strategically minded and gloriously mindless"
October 2017 is a risky time to be releasing a remastered cult classic from 2006. You're going up against Egyptian assassins, nazi-bashing beefcakes, and Super Mario himself, not to mention Call of Duty and Star Wars Battlefront 2 coming right around the corner. Still, you have to admire the confidence that Rebellion is placing in Rogue Trooper Redux to stand out amongst the competition, and this remaster certainly has its merits, even if none of its distinct highlights ever adds up to something truly exceptional. To those unfamiliar with Rogue Trooper, originally a 2000 AD comic book strip from Dave Gibbons and Gerry Finley-Day, Redux will likely hold some appeal purely based on the eccentricity of its high-concept story. Rogue is the last of his kind, a genetically engineered super-soldier created with the sole purpose of killing in a solar system that knows nothing but war, who begins a quest for vengeance after watching his entire army (and, subsequently, his entire species) get wiped out on the battlefield. Don't worry, though, as not everyone is dead per se. Instead, Rogue manages to quickly transfer the biochips of his three best friends into his helmet, backpack, and rifle respectively, which allows them to help him out in combat all while offering an endless supply of banter. It's like the blue man group, exact three of the blue men have transposed their consciences into the military gear of the remaining blue man, and that blue man doesn't so much do performance art as he does commit mass murder on an unprecedented scale. As far as video game backdrops go, this is a pretty interesting one, and Rebellion does a fantastic job of mining the source material to bring every aspect of Rogue Trooper's story and world to life, from the Soviet-inspired theatrics of the Nort soldiers you mow down to authentic cameos from classic 2000 AD characters (no Judge Dredd, though, sorry). As for how the story plays out, it's a relatively predictable sci-fi spin on the revenge western, but the elegantly directed cut-scenes and powerful iconography still impresses even for today's standards, though some of the cheesy voice acting hasn't aged with quite as much decorum. The better news is that the campaign, segmented into 13 distinct missions, is a long and varied adventure that continually snowballs into something richer and more expansive, so you'll definitely be getting value for money in terms of meaningful content. 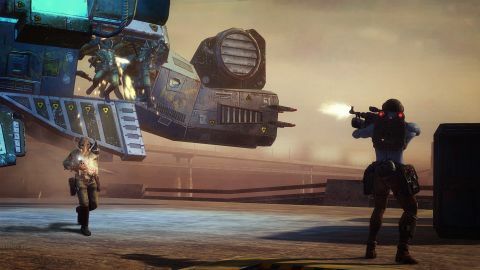 Rebellion has attempted to significantly tweak Rogue Trooper's controls and mechanics since its 2006 debut, but the new changes can't quite cover up the rigid senility of the game's sixth-generation design. The act of chucking a grenade or switching weapons - a smooth, almost instinctive processes that we take for granted in modern shooters - are incredibly fiddly here, impeding the flow of the combat and often leading to fail states that weren't necessarily the fault of the player. Getting in and out of cover also bears a same degree of finickiness, unintentionally making it much safer and more viable to run and gun in heated firefights, so as to avoid getting into sticky situations where the game's cover controls work against you. Rogue Trooper was considered something of a revolutionary for its unique cover mechanics in 2006, which at that point were almost unheard of in shooter games, but this remaster reminds us that being one of the first cover shooters doesn't necessarily make you one of the best. These are understandable flaws for a decade-old title, but less forgivable for a remaster being re-sold 11 years later. Once you do get yourself accustomed to the outdated mechanics, however, Rogue Trooper Redux does begin to work its charm as a shooter which somehow manages to feel both strategically minded and gloriously mindless. The "Play It Your Way" design philosophy of shooters is ubiquitous in today's market, but Rogue Trooper's decisively old-school interpretation of that maxim ends up feeling fresh. Rogue can place Gunnar (his buddy/rifle) down as an automated turret, turn into a hologram to draw away enemy fire, and can approach situations through brute force or patient strategy. One moment gives you the choice to either gun down a bunch of enemies the old fashioned way, or circumvent them to instead open up an enclosure of aggravated Stammels (sci-fi dinosaurs, essentially) to do the job for you. Environments are linear in structure but sweeping in size, which facilitates this emphasis on player-led tactics nicely. The only misnomer in this regard is the stealth, as the level design seem to be more geared towards open combat, meaning it's not long before enemies spot you even as you attempt to approach them covertly. Luckily, the act of spraying & praying is much more fun, with the auto-aim ability and responsive mechanics for rolls and dives imbuing the battles with a Max Payne-esque sense of dynamacy and aggression. Things feel more noticeably improved on the visual side of Rogue Trooper's new coat of paint, too. The bold colour palette, dominated heavily by blues and browns, is brilliantly accentuated by enhanced lighting and the jump to high definition, while gameplay runs at a consistent 60fps without so much as a hiccup. It has to be said that the remodelled assets look slightly less impressive when viewed up close, specifically with regards to facial animations and environmental textures, but Redux's new make-up generally succeeds in tastefully polishing up the game's retro aesthetics. Rogue Trooper Redux also returns the co-op mode from the original, and playing online is now much easier thanks to the marvels of modern technology. Stronghold is essentially a wave defense mode, while Progressive mode has you and up to three other friends making the push through the enemy forces yourself, fighting your way to a safe zone at the end of a level. These co-op accoutrements are designed to immediately get to the main course of Rogue Trooper's combat by firmly backgrounding the story, so there's fleeting fun to be had if you're particularly taken to the game's unique gunplay. It's a shame that the campaign itself doesn't include an option for co-op, as I could see this upping the entertainment value of the adventure significantly, narrative consistency be damned. "It generally succeeds in tastefully polishing up the game's retro aesthetics." Rogue Trooper Redux represents a slice of history that long-time fans of the source material or the original game will enjoy, but that same history is the remaster's biggest burden to carry. The anachronistic sentiments of its nostalgic design translates to clunky controls and awkward bouts of gameplay, even while the visuals and pulpy story shines. The best and worst thing I can say about Rogue Trooper Redux is that, more than anything, it made me wish I was playing a new, modern Rogue Trooper sequel or reboot, instead of a well-intentioned but inherently antiquated remaster.